Slowly adding in the HUD, while trying to fix a damn path finding bug! All of the path finding works smoothly except that the hero’s don’t know when to move out of the way when on top of each other. So they stack up in the same location and it is IMPOSSIBLE to separate them. I haven’t worked with path finding before so its taking me longer than an experienced user should. Anyways, with the HUD, the squares under the portraits will contain images of the three abilities each of the heroes will have. In the blank space on the right, there will be individual, miniature skill trees. They wont have much variety, but I’m aiming for a sort of system that feels like a RPG game condensed into a 5-8 minute level. Of course along with the zombie shooting which hopefully will become more strategical as I work on balancing everything out. 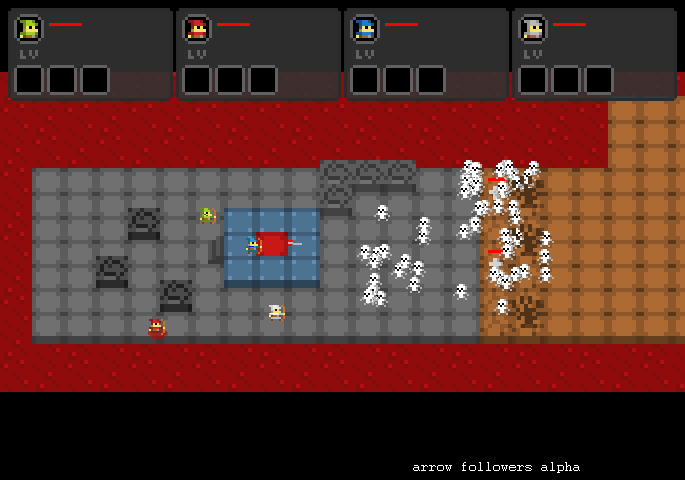 It’s just so pointless ATM because I’ll be adding abilities soon and more enemy types/traps in the future. I will make another game play video once I get the HUD finished…maybe even after abilities.